The platinum-group metals (PGMs) are iridium, osmium, palladium, platinum, rhodium, and ruthenium. In general, PGMs exhibit high density, high electrical conductivity, high melting points, and low reactivity. Platinum is commercially the most important of the PGMs. 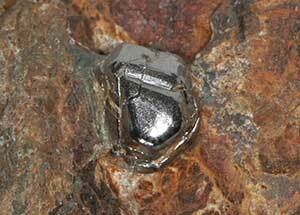 Platinum occurs in dark silicate rocks with minerals that contain iron and magnesium. It is usually found as fine grains or flakes scattered throughout the rock or as thin layers of metal ores called sulfides. In rare instances, platinum is found as nuggets in stream placer deposits. Platinum is the most commercial of the PGMs. The largest platinum producers are Canada, Russia, South Africa, and the United States. Platinum is used in automobile pollution abatement systems and jewelry and as catalysts to produce industrial chemicals. The name platinum refers to a mineral, an element and a group of elements. As an element, platinum (chemical symbol Pt) is a silvery-gray metal with an atomic number of 78. It belongs to a group of elements that are in the second and third triads of Group VIII of the Periodic Table of the Elements. The platinum group of elements consists of metals with similar physical properties. They are among the rarest elements in the Earth's crust. They have high melting points, are dense or heavy (mineralogists say they have a high specific gravity), and are very non-reactive to other elements and ions. The platinum group elements include: ruthenium (44), rhodium (45), palladium (46), osmium (76), iridium (77) and platinum (78). Of these elements, only platinum and palladium are found in a pure form in nature. The others occur in nature as natural alloys with platinum and gold, for example. In industry people refer to this group of elements as the platinum group metals, or simply as PGM. 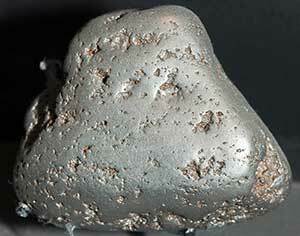 As a mineral, platinum occurs in dark silicate rocks with minerals containing iron and magnesium. It is usually found as fine grains or flakes scattered throughout the rock and rarely as large nuggets. It crystallizes in the cubic crystal system, but rarely forms actual crystals. The crystal drawings here are of very rare platinum alloy crystals from Russia. Platinum is metallic and, like gold and silver, is malleable (it can be hammered into sheets) and ductile (it can be drawn into wire). Most naturally occurring platinum is actually a mixture of platinum and iridium. Platinum has been known and used since antiquity in South America, where the use of platinum by the natives was discovered by Antonio de Ulloa of Spain in 1735. Because it is silver-gray in color, it was named after the Spanish word for silver, plata. Geologically, platinum is found in thin layers of metal ores called sulfides. These sulfide ores are found in mafic igneous rocks (that is, dark igneous rocks with high iron and magnesium content). In the United States, the only mines producing platinum group metals (PGM) are in what geologists call the Stillwater Complex of Montana. In recent years, old mines have been enlarged and a new mine has been established in this complex. Small amounts of PGM are recovered from copper processing in Texas and Utah. In 1822 large amounts of platinum were discovered in the Ural Mountains in Russia. Russia continues to be an important world source of PGM to this day. The most productive PGM mines are in South Africa in a geologic region known as the Bushveld Complex. Canada, Zimbabwe, and Australia also produce PGM. Significant amounts of platinum are recovered annually through recycling. In 1999, for example, 70 metric tons was recovered through recycling. This will continue to be an important part of PGM supplies in the future. Most platinum is used to produce catalytic converters in automobile exhaust systems. The goal is to limit the smog-producing chemicals that come from burning gasoline. When an internal combustion engine burns gasoline, nitrogen oxides (NOx) are produced. The exhaust passes through the catalytic converter that contains platinum and iridium. The gases are in the converter for 0.1 to 0.4 seconds and in that very short time, 75% of the nitrogen oxide is converted into nitrogen and oxygen. In addition, more than 95% of carbon monoxide and other hydrocarbons in the exhaust are oxidized. The platinum works by lowering the energy needed to cause these chemical changes. The result is a dramatic reduction in pollution. Although about one-third of all platinum is used by the automotive industry, there are various other uses. It is alloyed with gold, silver and copper for dental uses. PGM is used in chemotherapy, particularly to fight leukemia. Platinum-iridium compounds are used to make biomedical devices. An alloy of platinum and osmium is used in pacemakers to regulate heart function and in heart replacement valves. Some manufacturers are using less expensive palladium in place of platinum in catalytic converters. As a catalytic converter component in diesel engines, palladium is proving to be a better than platinum. Copyright © 2003-2010 Calvin & Rosanna Hamilton. All rights reserved.